Albumen photograph, on 9" x 11" Taylor and Huntington mount, from their War for the Union Photographic History series. From the glass negative by Alexander Gardner, as operator for Mathew Brady. 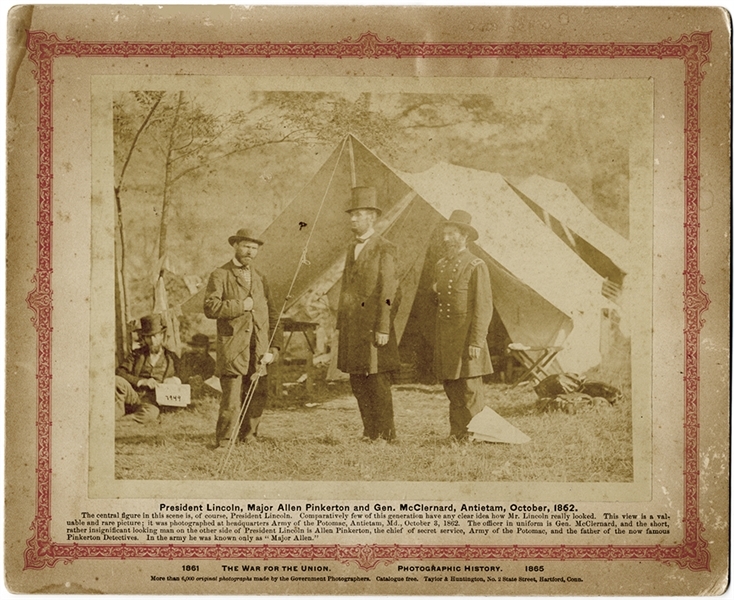 One of two known images of Lincoln posing with General McClernand and E.J. Allen taken during the President's visit with General McClellan and staff shortly after the bloody battle at Antietam, caption title “President Lincoln, Major Allen Pinkerton and Gen. McClernard, Antitam, October, 1862.” This photograph, like others from the Antietam series, was taken on October 3, 1862. In the photograph, Lincoln moves his head during the pose, so it is slightly blurred, and the detective, E.J. Allen, alias for Allan Pinkerton, exhibits a Napoleonic stance with his right hand thrust in his coat. Pinkerton (1819-1884) was head of the Union Intelligence Service between 1861 and 1862 and foiled an alleged assassination plot against Lincoln while guarding him on his way to his inauguration in Baltimore, MD. A photographic assistant holds a newspaper in the background. A list of other available prints is printed on the back. A very rare image, mount has some light age, albumen image has light tonality, else fine.